Still the coin with the lowest demand among collectors who buy gold, even the 1/2 oz Proof Gold Eagle experienced a significant jump in demand in 2005. 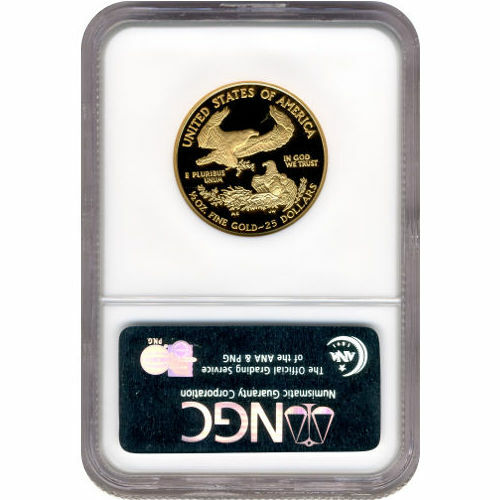 All versions of the Proof Gold Eagle coinage jumped in 2005, with the 1/10 oz coin again leading the way with the highest mintage figure and the greatest overall increase year-over-year. today, 2005 1/2 oz Proof Gold American Eagle Coins are available to you online at Silver.com in perfect condition. Coins ship to you inside of NGC protective plastic slabs! 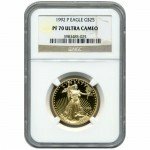 19th issue year for 1/2 oz Proof Gold Eagles! Availability limited within the original 34,311-coin mintage! Consists of One-Half Troy ounce of actual gold content. Augustus Saint-Gaudens’ Liberty on the obverse. Miley Busiek’s bald eagles on the reverse. Each of the four weights available in the Proof Gold American Eagle Series of coins from the United States Mint moved upward in 2005 as demand for gold increased. Gold prices were rising steadily in the early 2000s, and though some years saw the US Mint raise its premiums for collectible gold beyond the interest of collectors, 2005 was an exception. Although the price of gold itself rose steadily to close the year with a 20% increase, the increase in premiums by the US Mint did not go so far as to deter collectors from buying the Proof Gold American Eagle. The 1/2 oz Proof Gold American Eagle enjoyed a mintage increase in 2005 of 6,981 compared to the 2004 release of the coins. 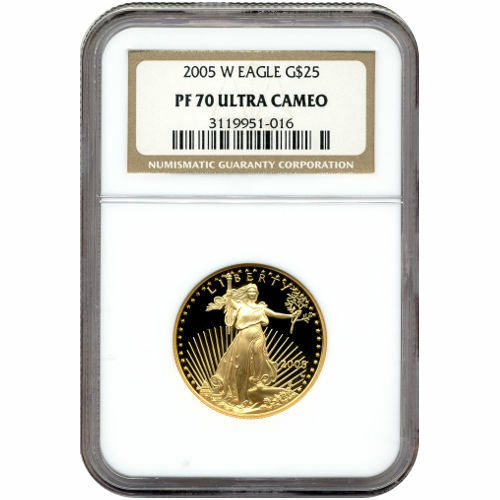 These 2005 1/2 oz Proof Gold Eagles available from Silver.com today have PF70 certifications from the NGC. Coins in this condition showcase full, original mint luster with no detracting flaws present. The ultra-cameo designation, or UCAM, indicates the coins have strong, frosted matte finishes on the design sets overlaying background fields which are deeply-mirrored and clear. On the reverse of 2005 Proof Gold American Eagle Coins is the design of American bald eagles. In this creation from Miley Busiek, an entire family of eagles is visible around the nest. The obverse side of 2005 1/2 oz Proof Gold American Eagle Coins features the vision of Liberty which sparked a revolution in American coin design in the early 20th century. This design originally appeared on the $20 Gold Double Eagle from 1907 to 1933. Please feel free to reach out to Silver.com with your questions. You can contact us on the phone at 888-989-7223, online using our live web chat, and via our email address.